Contraction and Convergence (also called Cap, Contraction, and Convergence) (1) is a concept for international agreement on greenhouse gas reduction. It has gained ground because it outlines a way to fight climate change that is fair and equitable for everyone on the planet. This video explaining the concept is from the film The Age of Stupid. We need to cap human carbon emissions at a level that will produce a rise in average global temperatures of no more than 2 degrees Celsius above pre-industrial levels. To understand why 2 degrees is an important limit, click here. The Intergovernmental Panel on Climate Change (IPCC) currently estimates the cap for greenhouse gas concentration in the atmosphere at about 450 parts per million (ppm) in carbon dioxide equivalents if we want to limit warming to 2 degrees Celcius. (2) The current (2014) concentration is about 400 ppm and growing at about 2 ppm per year. There are other scientists who have concluded that our goal should be to reduce the atmospheric greenhouse gas concentration to 350 parts per million (ppm). According to James Hansen of the NASA Goddard Institute for Space Studies: 350 ppm is the concentration of CO2 that should be in the atmosphere “if humanity wishes to preserve a planet similar to that on which civilization developed and to which life on Earth is adapted”. Visit 350.org. To sustain this 450 ppm greenhouse gas concentration it is proposed that all people on the planet should be allocated an equal carbon footprint. Currently that allocation would be about 2 tonnes per person. By 2050 that allocation would fall to about 1.5 tonnes per person due to the anticipated population increase. World carbon emissions are currently in excess of 4 tonnes per person. So, our emissions need to contract to 2 tonnes and then 1.5 tonnes by 2050, if the cap is to be met. Currently, the amount of greenhouse gas a person’s lifestyle creates depends a lot on where they live (3). The largest per capita emitters are in rich countries like Canada, US, and Australia. So, policies need to be instituted to converge over a fixed period towards 4 tonnes per person and then contract to 2 tonnes (and then 1.5 tonnes) per person for every country. This may require some form of carbon rationing and may involve international, or even local, trading. 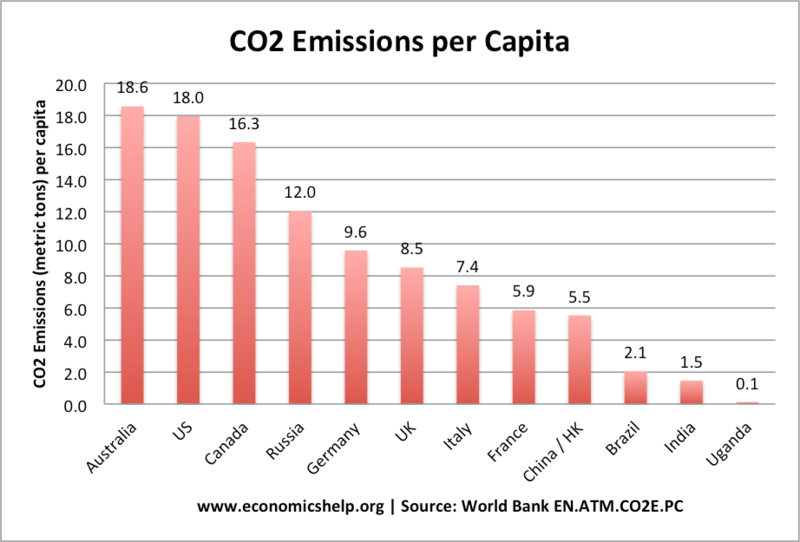 Countries (or individuals) in excess of the equitable global emission level would purchase carbon credits from countries (or individuals) using less than their allocation. Support for Contraction and Convergence has been growing as more people learn of it. It has support in Africa, India and China. It was endorsed by the European Parliament (4). It is supported by many campaigners and groups from George Monbiot (5) to the UK Royal Commission on Environmental Pollution.